A parked minivan with a year-old boy inside was stolen from the parking lot of a Montebello recycling center this afternoon as the child’s mother stood by helplessly, police said. Caleb Castro and his two sisters, ages 4 and 6, were inside the dark red Honda Odyssey parked at SA Recycling, 1545 Gage Road, when a man ordered the two girls out and drove away about 3 p.m., according to Montebello police. Baby taken during carjacking in Montebello. The children’s mother, intending to recycle some items, had left the keys in the vehicle and stepped about 10 feet from the minivan, police said. “The mother screamed that her baby was in the car; however the suspect fled with the vehicle out of the parking lot and southbound on Gage Road,” according to a police statement. 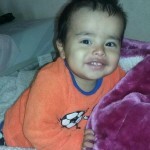 Caleb is Hispanic, about 2 feet tall and 22 pounds, with black hair and brown eyes. He was wearing a red Mickey Mouse shirt and black-and-gray camouflage sweat pants. The suspect, who spoke Spanish, was described as Hispanic and about 30 years old, with spiked hair. The California license plate number of the minivan is 6TRZ025. An Amber Alert has been issued. Anyone who spots the vehicle or the child was urged to cal 911.